Since fights over fracking began in the Barnett Shale, they've been mostly fights over specific permits, leases, or rules fought in one city at a time. Other than an occasional trip to Austin or DC to stop or support some piece of legislation, the action takes place in whatever community is putting up the most resistance. Front lines are fragmented and move around a lot. There's not a single cause that's united the energy from the multitude of ad hoc groups and individual "fracktivists" into a focused campaign for regional change. The closest thing to more encompassing battles have been the recent victories in Dallas and the current kickass campaign in Denton. These feel like old Cold War skirmishes – proxy clashes standing in for the on-going larger war over the Barnett Shale's soul. 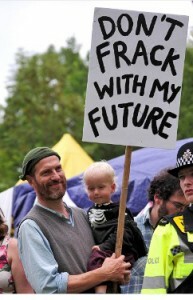 But from now until the summer of 2015 there's a regional fracking fight waiting to be fought. It involves new bureaucracies and terms and mechanics, so it makes a lot of traditional fracking foes nervous. But the payoff is the potential to affect change throughout a 10-county area, including the heart of the urban Barnett Shale – Tarrant, Parker, Denton, Johnson, Wise and Ellis – as well as Dallas, Collin, Kaufman, and Rockwall. What's the fight? It's over the new regional anti-smog plan, called a State Implementation Plan, or SIP. When a region hasn't met the federal standard for smog, also called ozone, it has to submit a plan to the EPA to explain how it's going to comply by the end of a three-year deadline. Despite at least three previous plans, DFW has never met the 1997 federal standard for smog. It's 85 ppb, or "parts per billion" concentration over 8 hours measured by approximately 20 stationary monitors scattered over the area. The closest we've come has been 86 ppb of ozone in 2009. The new DFW plan is supposed to be designed to meet an even more ambitious target – no monitor higher than a three-year running average of 75 ppb of ambient air by 2018. We're at 87 ppb now. To reach the new goal, DFW would have to drop 12 parts per billion in ambient smog levels in four years -something that's never happened before. Ozone/smog is created by a combination of Nitrogen Oxides (NOx) from combustion sources and Volatile Organic Compounds (VOCs) from combustion sources and evaporation sources mixing in daylight. The more sun, the more ozone. What are combustion sources of NOx and VOCs? Power plants and cement kilns. Every boiler and furnace and oven. Every internal combustion engine. Every diesel engine. Anything with a flame or a spark. What are evaporation sources of VOCs? Gasoline pumps,tanks and paint shops. An anti-smog plan is supposed to look at all the sources of smog-forming pollution in a region and find the cheapest and easiest ways to reduce it. Past plans have been responsible for putting more controls on coal-fired power plants and the Midlothian cement plants, as well as creating HOV lanes and tightening inspection standards for vehicles. But one large category of smog-forming emissions has been left largely untouched by past air plans – the gas and oil industry. It's not because gas and oil sources aren't capable of contributing to DFW smog. Start with all the trucks that are needed for each well and the NOx and VOC emissions they produce. Then the drilling rig itself. Some cities now require electric motors, others still allow diesel and the NOx and VOCs they produce. Think about all the chemicals being dumped into a well and then flowing back out, many of them VOCs. Flares are sources of both NOx and VOCs. Storage tanks and pipelines are huge sources of escaped evaporated VOCs. Diesel compressors are huge sources of NOx. There isn't a part of the oil and gas fuel cycle that doesn't produce smog-forming pollution. It's not because the oil and gas emissions are insignificant. In 2011, the Texas Commission on Environmental Quality estimated that the VOCs being released by all the oil and gas facilities in the DFW area were greater than the volume of VOCs being released by all the cars and trucks on the road in the same region. In 2012, a Houston Area Research Council report estimated that a single flare or compressor could raise downwind ozone levels 3 to 5 parts per billion as far as five to ten miles away. No, the oil and gas industry haven't been touched by these state anti-smog plans because the state doesn't want to impose new regional regulations on an industry. It's nothing personal. Austin doesn't want to impose new regulations on any industry. The last serious SIP was in 2007 – before the Barnett Shale boom and Rick Perry's presidential campaign. Since then, it's been one excuse after another from TCEQ about why no new controls are necessary – even though DFW air quality progress has stopped and we're still in violation of a 20-year old smog standard. It's also true that the oil and gas industry hasn't been touched by an air plan because no one's made them. No DFW anti-smog plan has been the focus of a fracking campaign like the recent Dallas Trinity East permits, or the Denton petition drive. There been no pressure on state government to respond to a regional demand for action. But the new DFW air plan does offer gas activists a chance to get reforms outside of their own city limits. For example, it could be the goal to include mandatory electrification of compressors in this plan. It's been estimated that 60 % or more of the air pollution from the gas fuel cycle comes from compressors. Electrification doesn't solve all their air pollution problems but it takes a huge bite out of them because the compressors are no longer being run by locomotive size diesel engines. Electrification of new compressors and a phase-in to replace existing diesel engines could reduce not just smog pollution, but toxic air pollution and greenhouse gases by thousands of tons a year. Even if Austin rejects such proposals, there's a part of every plan called the "Weight of Evidence" category that's more inclusive to voluntary measures. A recommendation for cities and counties to demand electrification of all compressors in the DFW region isn't as immediate as a state-sponsored mandate, but it's an official good housekeeping seal you can take to local city councils and pass one by one until it does become a de facto regional policy. This is exactly what happened with Downwinders' Green Cement procurement campaign from 2007-2011 aimed at getting rid of old wet cement kilns in Midlothian. A short recommendation to local governments about where to buy their cement in the 2007 SIP was turned into a model ordinance by Dallas and then passed by a dozen other entities, one by one, over the next two years. by the end of this year, there will be no wet kilns lift in Midlothian. The same thing could happen with compressors in this new plan, or green completions, or tanks, or pipelines in this new DFW air plan – if activists are willing to invest the same amount of time and energy into a regional fight as they do in their own backyard battles. You have a couple of chances in April to dip your toes into the SIP Process. 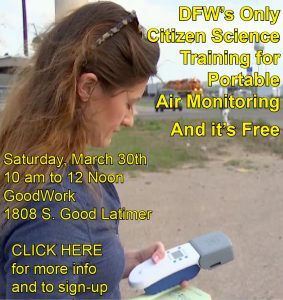 This coming Sunday, April 6th, from 3 to 5 pm at the Texas Campaign for the Environment office in Dallas, State Rep Lon Burnam and Downwinders at Risk will be hosting a strategy meeting for folks who want to know more about how to take advantage of this new air plan. Central to this strategy is involving more gas activists to win a regional fight, so y'all come. Then on April 17th, at 10 am at the North Central Council of Governments Headquarters in Arlington, there's a meeting of the SIP "technical committee" that will be hearing presentations from the state and others about DFW's smog problem. Don't let the "technical committee" name fool you. These are open to the public and anyone can attend. 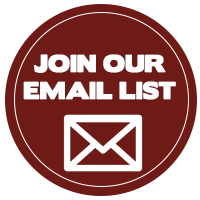 In fact, this is your chance to ask questions of the state and the experts. If this one fails, another new air plan will not be due until at least 2019 or 2020 at the earliest. This is our only chance until then to affect the gas industry over a wide area instead of just one permit or one city at a time. Let's try to make it count.